Choosing the right cat litter material is crucial to the success of cat litter training. A litter box or cat pan is a daily necessity for cats who need a proper place to relieve themselves. If you ever wondered ‘what is cat litter made of?’ and which varieties are safe for your cats, here is a quick guide for you. Commercial cat litters are made from materials that simulate your cat’s instinct to dig for relief. These highly-absorbent materials collect a day’s worth of urine or even up to a month. Cat parents are mostly concerned about cat litter ingestion. Others also worry about cat litter aversion, so we made this list to help you find the best cat litter for your feline friend. Cats are typically drawn to sandboxes. Outdoor cats find sand and soil easiest to dig because of their texture so it could be an option if you’re transitioning an outdoor cat to litter use. While it’s a cheap option, it is messy and the cat leaves tracks indoors. Clay cat litter is commonly used among cat families. It keeps odors and tracking at bay for a short period. While it is a cheap option, traditional clay cat litter needs to be emptied and cleaned often. Bentonite clay does not merely absorb urine; it forms solid clumps for easy scooping. It eliminates the need to empty the litter box as often as non-clumping clay. However, clumping clay is dust-heavy and can put cats and other pets at risk of gastrointestinal symptoms when ingested. Some clumping clay products also contain fragrances to remove odors, but cats can have an aversion to scented cat litters like those with floral and citrus scents. If you are looking for a non-clay cat litter, silica gel or crystal litter is the most low-maintenance option of all. Commonly found in shoeboxes and medications, crystal litter has little to no dust and is great at absorbing urine. It can take three weeks to a month before you need to replenish the cat litter. Some silica-based cat litters even change color to alert cat guardians of possible health conditions like blood in urine or acidic urine. If you get worried whenever your cat companion licks the litter granules from his paws, biodegradable litter is what you need. Wood pellets decompose naturally and are inexpensive. Wood pellets expand when they absorb urine so be careful not to overfill the cat litter box. Typically made from heat-treated sawdust, it is available in granules, cobbles, or pellets and is pine-scented to control odor. It is cheap, but eventually, you will have problems with tracking when the pellets revert to sawdust. Cats who undergo surgery should not use fine-grained cat litter for some time. Cat litter made from recycled paper can be an option, and it is dust-free. However, it does not clump or remove odor at all. Corn litter is known for its superior clumping qualities, making scooping easy. Some pellets can be too big, which cats avoid. Ingestion can be a problem with corn litter too, and vets generally advise against using corn litter for cats with asthma. It works well with clumping and odor control. Tracking can be a problem as well as bug infestation like cockroaches. Cats should not ingest wheat at all. When introducing your cat to litter training, it is nice to give him or her some options. Some cats are picky with the texture of their cat litter and just as you are particular about odor, so are they. While they may tolerate baking soda, pine, cedar chips, and carbon, picky cats steer away from scented brands. Also, remember that most of these materials should not be flushed down the drain. 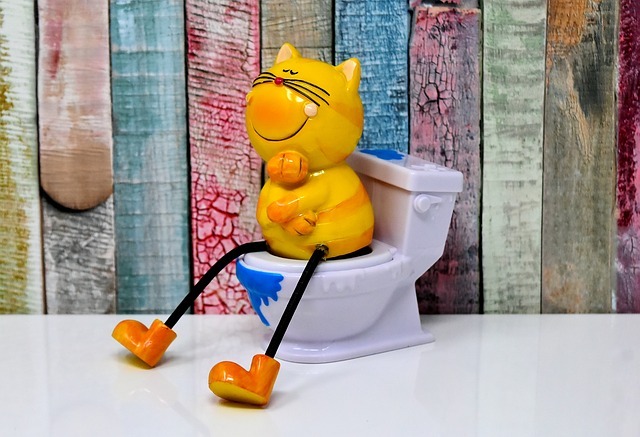 Clumping clay cat litter in the toilet can clog pipes as it solidifies in contact with water. It is best to compost cat litter made of biodegradable materials. Clay, sand, and crystal litters should go nowhere but the trash. The cat litter systems you use can also determine your success when it comes to litter training. Some cats prefer enclosed litter boxes while cat owners are often drawn to self-cleaning systems. Whatever type of cat litter you choose, your cat’s health should be a top priority, so make sure you change the cat litter on a regular basis. MyFelineBuddy.com is a participant in the Amazon Services LLC Associates Program, which is an affiliate advertising program that is developed to provide the means for sites to earn fees by linking and advertising to Amazon.com. ⓒ 2019 – My Feline Buddy. All Rights Reserved.